© 2018 The Korean Society For Biomedical Laboratory Sciences. Received January 3, 2018; Revised March 5, 2018; Accepted March 6, 2018. 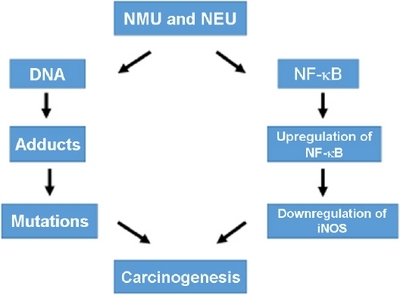 N-nitroso-N-methylurea (NMU) and N-nitroso-N-ethylurea (NEU), direct alkylating chemical mutagens and carcinogens, are shown to be the upregulators of cellular NF-κB, regulating various genes that mediate tumorigenesis and carcinogenesis. Nitric oxide (NO), a toxic reactive radical gas, has been known to induce programmed cell death or apoptosis in various cells. Therefore, the assessment of NO production was examined to elucidate the possible contribution of NO release to the chemical carcinogenic potency of NMU and NEU in human skin cells. NMU and NEU did not alter the NO production, but they caused a significant downregulation of the NO generation on lipopolysaccharide (LPS)-induced NO production at concentrations ranging from 2~5 μM. The degree of downregulation of NO by NMU and NEU decreased up to 15% and 20%, respectively, compared to the control. These results demonstrate that the LPS-inducible keratinocytes NO synthase is involved in modulating carcinogenic potency by NMU and NEU, and the regulation of the cellular NF-κB activity by NMU and NEU is negatively correlated with the level of LPS-induced NO production in human skin cells. The findings of this study suggest the hypothesis that NMU and NEU-induced carcinogenesis may be associated with the downregulation of NO production, and the inducible NO may play an important role in NMU and NEU-induced carcinogenicity in human epidermal keratinocytes. Exposure to low levels of many environmental stimuli, i.e., ultraviolet radiation and hazardous chemicals in the environment is essentially unavoidable, and skin is a primary target for a variety of chemical carcinogens. Direct alkylating chemicals such as N-nitroso-N-methylurea (NMU) and N-nitroso-N-ethylurea (NEU) are known to be mutagens and carcinogens (Likhachev et al., 1983; Sukumar et al., 1983; Zarbl et al., 1985; Nakamura et al., 1994), and the covalent modification of cellular DNA has been recognized in the initiation of carcinogenic processes through mutagenic mechanisms (Scheme 1). NF-κB expression has been involved in the development or progression of a variety of human cancers, as well as in the regulation of apoptosis both in normal and cancer cells (Bours et al., 1994, 2000; Rayet and Gelinas, 1999; Li et al., 2015). Several studies have demonstrated that chemical carcinogens are frequently causing carcinogenicity associated with the regulation of NF-κB activity (Saliou et al., 1999; Perez et al., 2000; Moon et al., 2003; Moon, 2007, 2010, 2011). In particular, NMU and NEU are reported to significantly upregulated cellular NF-κB activation, and suggested that their carcinogenicity might be associated with the modulation of cellular NF-κB activity in human skin cells (Moon et al., 2003; Moon, 2007, 2010). Nitric oxide (NO), a reactive and toxic radical gas, has been known to induce programmed cell death or apoptosis in various cells (Moncada et al., 1991; Nathan and Xie, 1994). However, little attention has been focused on the role of cellular NF-κB activation in modulating NO production by NMU and NEU and the possible implication of NO on the NMU and NEU-induced carcinogenicity. NF-κB is known to be a central regulator of inducible nitric oxide synthase (iNOS) expression. Therefore, iNOS dependent production of NO was assessed to examine the regulatory effect of NMU and NEU on the NF-κB activity correlating to NO release (Roméro-Graillet et al., 1997; Seo et al., 2002; Lee et al., 2005) and a possible contribution of NO to the chemical carcinogenic potency of NMU and NEU as well in human skin cells. The effect of NMU and NEU on the cellular NF-κB activation was evaluated to investigate a possible correlation between the activation of cellular NF-κB activity and its consecutive sequence, NO production in human skin cells. The change in NF-κB activity was measured in human keratinocytes, stably transfected with pNF-κB-SEAP-NPT plasmid (Moon et al., 2001; Moon, 2007, 2010, 2011). The treatment of transfectant keratinocytes with NMU (5 μM) and NEU (5 μM) resulted in the upregulation of cellular NF-κB activity up to 38% and 35% compared to the control, respectively, and was consistent with the previous results (Moon et al., 2003; Moon, 2007, 2010). This data suggests that the cellular NF-κB activation regulated by NMU and NEU may be involved in NMU and NEU-induced carcinogenicity in human skin cells. The cytotoxicity of the NMU, NEU, and LPS evaluated by the MTT assay (Scudiero et al., 1988) showed that the alkylating carcinogens and LPS concentrations used for the in vitro studies did not affect the keratinocyte cell viability (Table 1). aThe values are represented as Mean ± S.D. of three independent experiments. bThis value is defined as 100 for each experiment. Cell survival was determined by measuring the MDH activities of transfectant human malignant keratinocytes when exposed to the concentrations of NMU, NEU, and LPS tested. No significant difference in cell viability was found between alkylating agents and LPS-treated and nontreated cells. Because cellular NF-κB is a central regulator of inducible nitric oxide synthase (iNOS) expression, iNOS dependent production of nitric oxide (NO) was measured to examine the upregulatory effect of NMU and NEU on NF-κB activation correlating to the regulation of NO production in human skin cells. To investigate the possible correlation of cellular NF-κB activity with the generation of NO by NMU and NEU, the cultured malignant human epidermal keratinocytes were treated with alkylating chemicals with or without lipopolysaccharide (LPS). The human keratinocytes revealed a marginal NO production ability in the absence of LPS, showing no distinguishable difference in NO releases between the control and NMU or NEU treated cells (Fig. 1A and 1B), but NMU and NEU significantly decreased the LPS-induced NO production in a dose response manner at concentrations of 2~5 μM (Fig. 2A and 2B). Effect of NMU and NEU on nitric oxide (NO) production in transfected human malignant keratinocytes. (A) No regulatory effect of NMU on NO production. (B) No regulatory effect of NEU on NO production. Dose-dependent inhibition of LPS-induced nitric oxide (NO) production by NMU and NEU in transfected human malignant keratinocytes. (A) Downregulatory effect of NMU on LPS-induced NO production. (B) Downregulatory effect of NEU on LPS-induced NO production. NMU and NEU were added to the culture medium on 0 h of incubation, and NO productions were measured at 12, 24, 36, and 48 h after exposure to the chemicals. Each value represents the mean ± S.E. of three experiments. A significant difference in LPS-induced NO productions between the control and NMU or NEU treated samples was indicated by P < 0.01. These results demonstrate that human malignant keratinocytes (SCC-13) secrete nitric oxide (NO) in response to LPS, and the LPS-inducible keratinocytes NO synthase is involved in NMU and NEU-induced chemical carcinogenesis (Heck et al., 1992; Bécherel et al., 1997; Moon, 2011). Remarkably, the data showed that NMU and NEU decreased the iNOS-dependent production of NO, representing that the regulation of cellular NF-κB activity by NMU and NEU was negatively correlated to the level of LPS-induced NO production, suggesting that the downregulation of inducible NO generation may play an important role in NMU and NEU-induced carcinogenesis and cell proliferations as well in human epidermal keratinocytes. The inducible transcription factor NF-κB-mediated signal transduction has been implicated in the regulation of the inflammatory response, tumorigenesis, apoptosis, and carcinogenesis (Bours et al., 1994, 2000; Rayet and Gelinas, 1999; Moon, 2007, 2010, 2011). The overproduction and long lasting of NO have been established to initiate apoptosis in various cells (Messmer et al., 1995; Jun et al., 1998; Brüne et al., 1999). However, the molecular mechanisms associated with NMU and NEU-mediated carcinogenic process, as linked to NO, for carcinogenicity has not been studied. Therefore, this study examined whether the carcinogenic alkylating chemicals such as NMU and NEU regulate chemical carcinogenesis through the modulation of NO production and then attempted to elucidate a possible correlation between the upregulation of cellular NF-κB activity and its consecutive sequence, NO generation in cultured human skin cells by NMU and NEU. Acrolein is known to be an alkylating chemical carcinogen, downregulating the NF-κB activity in an I-κBα independent manner, which in turn reduce the generation of NO in human malignant keratinocytes (Moon, 2011). This result indicates that acrolein inhibits iNOS-dependent production of NO by a mechanism involving the downregulation of NF-κB activation. NMU and NEU are reported to be direct alkylating chemical carcinogens upregulating the cellular NF-κB activity (Moon et al., 2003; Moon, 2007), indicating that their up-regulatory effect was via the protein kinase C-mediated signaling pathway in human malignant keratinocytes (Moon, 2010). In this study, NMU and NEU also induced the upregulation of NF-κB activity in epidermal keratinocytes, and their regulatory effect on cellular NF-κB activity was not consistent with the inhibitory effect on the LPS-induced NO production, even they have demonstrated characteristics of a potent alkylating carcinogens. Therefore, a number of different alkylating carcinogenic chemicals revealed marked differences in the mode of the activation pathways of NF-κB and its consecutive sequence, NO generation (Scheme 1). This study reports the upregulation of NF-κB activity induced by NMU and NEU, which in turn decreases the NO production in cultured human keratinocytes and shows marked differences in the mode of the generation of NO with a number of different alkylating carcinogenic chemicals, i.e., acrolein (Bomsztyk et al., 1991; Legrand-Poels et al., 1997; Moon, 2010, 2011). These results may provide the feasibility of a novel therapeutic approach for preventing or treating cancer based on the specific regulation of the NF-κB activation pathway as well as NO production and further suggests that the NF-κB-mediated signal pathway and NO release may play an important role in NMU and NEU-induced chemical carcinogenesis in human epidermal keratinocytes (Moon et al., 2003; Moon, 2007, 2010, 2011). The findings now suggest that the downregulation of inducible NO production may play an important role in NMU and NEU-induced carcinogenesis in human skin cells. This study was supported by Grant from the IMHWAN Foundation to Prof. Ki-Young Moon. “No conflicts of interest, financial or otherwise, are declared by the author”. Bécherel PA, Chosidow O, Le Goff L, Francès C, Debré P, Mossalayi MD, and Arock M. Inducible nitric oxide synthase and proinflammatory cytokine expression by human keratinocytes during acute urticaria. Molecular Medicine 1997;3:686-694. Bours V, Bentires-Alj M, Hellin AC, Viatour P, Robe P, Delhalle S, Benoit V, and Merville MP. Nuclear factor-κB, cancer, and apoptosis. Biochemical Pharmacology 2000;60:1085-1090. Bours V, Dejardin E, Goujon-Letawe F, Merville MP, and Castronovo V. The NF-kappa B transcription factor and cancer: high expression of NF-kappa B-and I kappa B-related proteins in tumor cell lines. Biochemical Pharmacology 1994;47:145-149. Bomsztyk K, Rooney JW, Iwasaki T, Rachie NA, Dower SK, and Sibley CH. Evidence that interleukin-1 and phorbol esters activate NF-κB by different pathways: role of protein kinase C. Cell Regulation 1991;2:329-335. Brüne B, von Knethen A, and Sandau KB. Nitric oxide (NO): an effector of apoptosis. Cell Death and Differentiation 1999;6:969-975. Heck DE, Laskin DL, Gardner CR, and Laskin JD. Epidermal growth factor suppresses nitric oxide and hydrogen peroxide production by keratinocytes. Potential role for nitric oxide in the regulation of wound healing. Journal of Biological Chemistry 1992;267:21277-21280. Jun CD, Pae HO, Yoo JC, Kwak HJ, Park RK, and Chung HT. Cyclic adenosine monophosphate inhibits nitric oxide-induced apoptosis in human leukemic HL-60 cells. Cellular Immunology 1998;183:13-21. Lee SH, Lee SY, Son DJ, Lee H, Yoo HS, Song S, Oh KW, Han DC, Kwon BM, and Hong JT. Inhibitory effect of 2'-hydroxycinnam-aldehyde on nitric oxide production through inhibition of NF-κB activation in RAW 264.7 cells. Biochemical Pharmacology 2005;69:791-799. Legrand-Poels S, Zecchinon L, Piret B, Schoonbroodt S, and Piette J. Involvement of different transduction pathways in NF-κB activation by several inducers. Free Radical Research 1997;27:301-309. Likhachev AJ, Ivanov MN, Bresil H, Planche-Martel G, Montesano R, and Margison GP. Carcinogenicity of single doses of N-nitroso -N- methylurea and N-nitroso -N- ethylurea in syrian golden hamsters and the persistence of alkylated purines in the DNA of various tissues. Cancer Research 1983;43:829-833. Li F, Zhang J, Arfuso F, Chinnathambi A, Zayed ME, Alharbi SA, Kumar AP, Ahn KS, and Sethi G. NF-κB in cancer therapy. Archives of Toxicology 2015;89:711-731. Messmer UK, Lapetina EG, and Brüne B. Nitric oxide-induced apoptosis in RAW 264.7 macrophages is antagonized by protein kinase C- and protein kinase A-activating compounds. Molecular Pharmacology 1995;47:757-765. Moncada S, Palmer RMJ, and Higgs EA. Nitric oxide: physiology, pathophysiology, and pharmacology. Pharmacological Reviews 1991;43:109-140. Moon KY. The chemopreventive effect of retinoids on cellular NF-κB activity induced by NMU and NEU in human malignant keratinocytes. Cancer Research and Treatment 2007;39:82-87. Moon KY. N-nitroso -N- methylurea and N-nitroso -N- ethylurea induce upregulation of cellular NF-κB activity through protein kinase C-dependent pathway in human malignant keratinocytes. Archives of Pharmacal Research 2010;33:133-139. Moon KY. Acrolein, an I-κBα-independent downregulation of NF-κB activity, causes the decrease in nitric oxide production in human malignant keratinocytes. Archives of Toxicology 2011;85:499-504. Moon KY, Hahn BS, Lee J, and Kim YS. A cell-based assay system for monitoring NF-κB activity in human HaCaT transfectant cells. Analytical Biochemistry 2001;292:17-21. Moon KY, Lee YJ, and Kim YS. Upregulation of cellular NF-κB activity by alkylating carcinogens in human epidermal kerainocytes. Biological and Pharmaceutical Bulletin 2003;26:1195-1197. Nakamura T, Ushijima T, Ishizaka Y, Nagao M, Nemoto T, Hara M, and Ishikawa T. Neu proto-oncogene mutation is specific for the neurofibromas in a N-nitroso -N- ethylurea-induced hamster neurofibromatosis model but not for hamster melanomas and human Schwann cell tumors. Cancer Research 1994;54:976-980. Nathan C, and Xie QW. Nitric oxide synthases: roles, tolls, and controls. Cell 1994;78:915-918. Perez P, Page A, and Jorcano JL. Role of phosphorylated p50-NF-κB in the ultraviolet response of mouse skin. Molecular Carcinogenesis 2000;27:272-279. Rayet B, and Gelinas C. Aberrant rel/nfkb genes and activity in human cancer. Oncogene 1999;18:6938-6947. Roméro-Graillet C, Aberdam E, Clément M, Ortonne JP, and Ballotti R. Nitric oxide produced by ultraviolet-irradiated keratinocytes stimulates melanogenesis. Journal of Clinical Investigation 1997;99:635-642. Saliou C, Kitazawa M, McLaughlin L, Yang JP, Lodge JK, Tetsuka T, Iwasaki K, Cillard J, Okamoto T, and Packer L. Antioxidants modulate acute solar ultraviolet radiation-induced NF-kappa-B activation in a human keratinocyte cell line. Free Radical Biology and Medicine 1999;26:174-183. Scudiero DA, Shoemaker RH, Paull KD, Monks A, Tierney S, Nofziger TH, Currens MJ, Seniff D, and Boyd MR. Evaluation of a soluble tetrazolium/formazan assay for cell growth and drug sensitivity in culture using human and other tumor cell lines. Cancer Research 1988;48:4827-4833. Seo SJ, Choi HG, Chung HJ, and Hong CK. Time course of expression of mRNA of inducible nitric oxide synthase and generation of nitric oxide by ultraviolet B in keratinocyte cell lines. British Journal of Dermatology 2002;147:655-662. Sukumar S, Notario V, Martin-Zanca D, and Barbacid M. Induction of mammary carcinomas in rats by nitroso-methylurea involves malignant activation of H-ras-1 locus by single point mutations. Nature 1983;306:658-661. Zarbl H, Sukumar S, Arthur AV, Martin-Zanca D, and Barbacid M. Direct mutagenesis of Ha-ras-1 oncogenes by N-Nitroso -N- methylurea during initiation of mammary carcinogenesis in rats. Nature 1985;315:382-385.